Brand-new set from Pastor Bobby Schuller! Pastor Bobby Schuller’s new “How-To” series guides you through the most important steps of your spiritual walk! The DIY: How to Read Your Bible booklet — containing Pastor Bobby’s personal reading plan to help at any stage of life. It will revitalize and re-energize your daily quiet time with the Word! 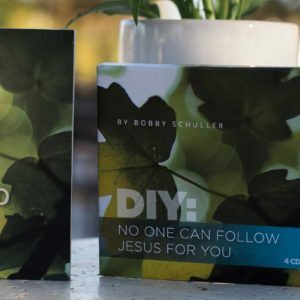 The DIY: No One Can Follow Jesus for You message series — practical messages like How to Read Your Bible, How to Pray, How to Give, How to Share Your Faith, and others will inspire and guide you — and are perfect to share with loved ones! New Beginnings Cards — 6 two-sided cards with beautiful illustrations, and powerful Scripture and quotes by Pastor Bobby — perfect to encourage you or your loved ones that with God, anything is possible. Request your set today as our way of saying “thank you” for your generous ministry gift of $60 or more. Your contribution will help many people, just like you and your family members, discover the truth that God loves them — and that through Christ, they have dignity. Thank you for your support!